What is Blood? What serological tests are used to detect it? Blood is composed of blood cells and platelets suspended in a liquid (plasma). Plasma is comprised of water, dissolved proteins, glucose, mineral ions, hormones, carbon dioxide and clotting factors. The blood cells can be divided into two general varieties – red blood cells (erythrocytes) and white blood cells (leukocytes). Red blood cells contain hemoglobin for oxygen transport but do not have a nucleus and thus are not suitable for DNA profiling. White blood cells are responsible for immune defense and are nucleated (i.e., contain DNA). It is only the white blood cells, therefore, that can yield a DNA profile from a blood sample. There are a variety of serological methods used by forensic analysts as a presumptive screen for blood. Tests such as phenolphthalein, Lumenol and BlueStar® suggest the presence of blood but cannot indicate if the blood is of human versus animal origin. Other serological assays such as HemDirect® and HemaTrace® tests provide a presumptive indication of blood that is of human origin. What is the Phenolphthalein Test? How specific is it and what can cause a false positive result? The Phenolphthalein test provides a chemical indication of the presence of hemoglobin. As such, it is a presumptive test for either human or animal blood. The peroxidase-like activity of hemoglobin results in the oxidation of phenolphthalein, to yield a bright pink color. The Phenolphthalein test will give a false positive result in the presence of vegetable peroxidases (e.g., horseradish, broccoli, cauliflower or fruit juice) or any other oxidizing species (e.g., copper or nickel salts). This test yields the same results with human blood as it does with any hemoglobin-based blood of animal origin. What is the HemDirect®/HemaTrace® Test? How specific is it and what can cause a false positive result? The HemDirect® and HemaTrace® assays are used for the presumptive identification of human hemoglobin and thus the presence of blood of human origin. The test is based on an interaction between a monoclonal antibody targeted to human hemoglobin. These monoclonal antibodies are labeled with a pink dye. In the presence of human hemoglobin the labeled monoclonal antibodies migrate across the test device and aggregate upon contact with a second, stationary phase antibody that also recognizes human hemoglobin. The aggregation of the labeled antibodies produces a pink line that is visible to the naked eye. The formation of this pink line serves as a presumptive indication of the presence of human hemoglobin and thus by extension, human blood. The testing device also features an internal positive control that yields a second pink line indicating the test worked properly. Thus the presence of two pink lines indicates a positive result while the presence of only the control line indicates a negative result. The absence of the control line invalidates the test. These tests provide only a presumptive indication of human blood. This test is known to yield false positive results with the blood of higher-order primates and ferrets. 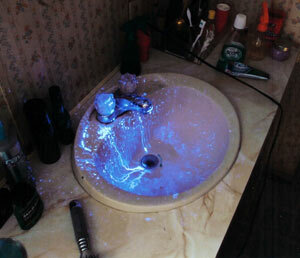 What is Luminol and BlueStar®? How specific are they and what can cause a false positive result? Both Luminol and BlueStar® are chemiluminescence tests with similar mechanisms. Both require the use of a catalyst - which, in the case of blood, is the iron that is found in Hemoglobin. In the presence of blood, the Luminol or BlueStar® with luminesce a blue color. Both of these tests are sensitive enough to detect blood that is both aged or that has been diluted due to cleaning of a crime scene. Luminol is a carcinogenic agent that can produce false positives in the presence of strong oxidants, some metal ions, or peroxidases. BlueStar® was derived from Luminol and is used for the same purposes, it - however - is a longer lasting chemistry and allows for crime scene personnel to work under a dimly lit environment rather than complete darkness. Both tests are considered presumptive as they will react with any hemoglobin-based blood of animal origin.